'..... We had heard about house exchanges but it was only one autumn evening after a glass or two of wine that we decided to take it further. We began by signing up with Home Base, an internet-only agency. For a £29 annual subscription, our carefully-worded description of our house - with a picture taken on a sunny day - was rapidly posted on their website. We were astonished by the almost instant response. Within days we had received offers from all over the world - including a family wanting to swap their extraordinary-sounding home in the Mojave desert for our suburban south London terrace. Read Nick's full article on his family's home exchange to Rome. Exchanging Homes: With an 'Overgrown Hippie'?! ... until next week! Read previous issues and/or subscribe to Home Swappers Newsletter. 'This story would be broadcast during our evening news in France and would last about two minutes. It may sound short but it still takes a lot of time to organise and film! What we are looking at is to film the French family as they arrive and settle down in their "new property" in England and at the same time film the English family enjoying their cheese and red wine in their new home in France. If you are a Home Base Holidays member and would like to find out more or have any questions, please contact us and your message will be forwarded to Lamia who will reply to you directly. Q: I have a 4 bedroom house to let for the week of the 134th British Open Golf Championship at St Andrews, sleeping 6 to 8 people, situated 5 minutes from the Old Course. A: The majority of Home Base Holidays members hope to arrange direct home exchanges but rental offered of a home or second home (i.e. non commercial) is another option that is available. Members who are unable to arrange the exchange they want will often be open to rental offers in the location. So, although Home Base Holidays is not a specialist rental site, you could certainly list your home and, as it is available for a popular local event, it is very likely you would find interest. If you do decide to join, complete the membership form with details of your home but, in the destination box, include Rental only (British Open Golf Championship) and select the dates and one week period. Include information on the accommodation and rates in your listing. Note: you can always change your offer to home exchange later on during your membership. If you do a search on the web, you may also find a holiday rental site that specialises in Scottish or golf locations that would be a good place to also list your home. Well, how are we doing so far? I only started this blog in early September 2004 but it seems like it has been part of my life forever! Blogging is great for people who enjoy writing (and, by the large number of weblogs out there, there are a lot of us about) but, with a blog like Travel the Home Exchange Way, it is important to know if it is serving it's purpose, i.e. addressing issues related to home exchange vacations in a clear and informative way. I came across a website this week, The Weblog Review, which does exactly what it says - provides a very useful weblog review service, with a large number of volunteers writing reviews of new weblogs submitted every week. When starting the home exchange weblog, I believed that most visitors would be Home Base Holidays members, Home Swappers subscribers and people aware of the idea of home swapping already but who wanted more information before trying it out themselves. The visitors I hadn't really anticipated are those that happen upon the weblog, perhaps when searching for something else, and who need a good, concise description of home exhange to be tempted to spend time reading the posts to find out more. This is what was especially useful in the feedback provided by the three reviewers from The Weblog Review who all took the time to give thoughtful comments; none of the three had heard of home exchange vacations before and, for this reason, their feedback is particularly valuable - I plan to address a couple of points they raised very soon! 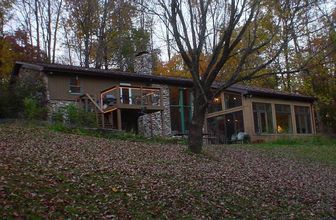 This is a wonderful suburban country tri-level home on 2 acres next to 10 acres of a private hardwood and pine forest; shared 2 acre stocked lake; boats, water toys, fishing gear. Evansville, IN, pop. 170,000, is on the Ohio River in the heart of the beautiful Midwest USA; within three hours drive-time to exciting cities such as Louisville, KY, Nashville, TN, St. Louis, MO and Indianapolis, IN. It is 5 1/2 hrs. to Chicago. Ski resort is 1 1/2 hrs. away.